High winds and turbulent weather go hand in hand with one's daily exsitence when situated at over 14,000 ft above sea level. Rocky Mountain National Park's highest peak, Longs Peak is no stranger to high winds having recorded the state of Colorado's highest wind gust at 201 mph in 1981. While the winds aren't raking the 14,259 ft high summit of Longs Peak with that kind of velocity this morning, the summit would be a forboding place to be. Lenticular or mountain wave clouds form along the Front Range when high winds are present in the upper atmosphere. This particular morning, a beautiful wave cloud setup just to the east of Longs Peak. 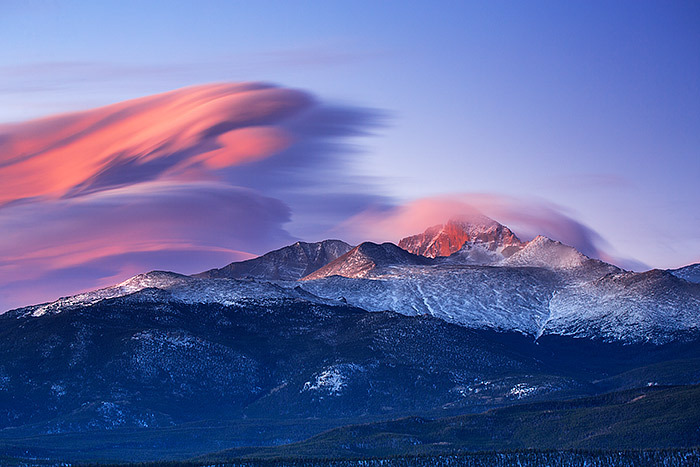 As this wave cloud grew, it gave the appearance of a large tidal wave about to overtake Longs Peak. Sunrise colored this lenticular cloud in beautiful hue of orange and red. Photo © copyright by Thomas Mangan.